The Squadron is back! Bigger, better, and more evil than ever! This June, the bad guys come out to play in SQUADRON SINISTER #1 – an all-new Secret Wars series! Writer Marc Guggenheim (Arrow Executive Producer) and artist Carlos Pacheco (Captain America) bring you an epic crime story of superpowered proportions! Hyperion, Nighthawk, Whizzer, Doctor Spectrum and Warrior Woman. Together they make up the deadliest team of villains Battleworld has ever seen. Lording over their domain of Utopolis, they dispense devastating justice to any and all in their path. But will controlling just Utopolis be enough to feed their lust for power? But threats from without and threats from within seek to undo everything Hyperion and his gang have built. Rulers from other domains mobilize against these superpowered aggressors. Devastating lies and secrets from within the Squadron itself may tear the team asunder. And seeds sown here bear bitter fruit for the future of the Marvel Universe. The measuring stick for evil just changed – and these five titans are it! Can anyone stop them? They’ll certainly try! 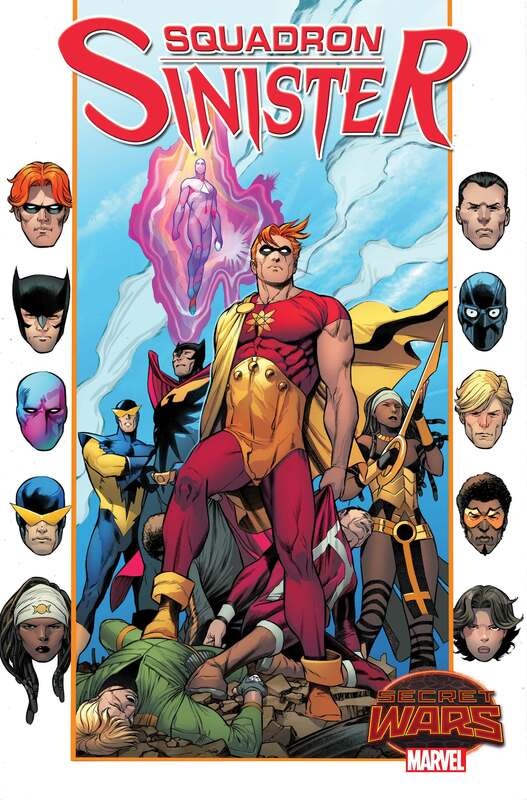 Be there when Battleworld quivers beneath their might in SQUADRON SINISTER #1 – on sale this June!